It's Easter this Sunday, April 21, and families can celebrate by joining in an Easter egg hunt the day before. Below are five egg hunts in the Philly area, and one happening at the Jersey Shore. Thousands of eggs will be hidden at Penn Treaty Park in Fishtown on Saturday afternoon. The free event is open to all children age 11 and younger. Just make sure to register here before going. At the park, there will be face painting, arts & crafts, food trucks, a DJ and photo opportunities with the Easter Bunny, too. Saturday morning, there will be a massive egg hunt at Gorgas Park in Roxborough. Thirty-five thousand candy-filled eggs will be hidden for kids to find and collect. Plus, there will be a petting zoo, face painting, balloon animals and photo ops with the Easter Bunny. Register for the free event here and you could win a $100 Amazon gift card. Children age 11 and younger can hunt for eggs in the historic Reading Terminal Market. The egg hunt will start at 8 a.m. Remember to bring a basket. Kids can also get their picture taken with the Easter Bunny between 8:30 a.m. and noon. The Tyler Arboretum in Media is hosting two egg hunts on Saturday. Participants, age 4 and older, will use a GPS and solve riddles to find the hidden eggs. Tickets are $15 ($10 for members) and can be purchased here. 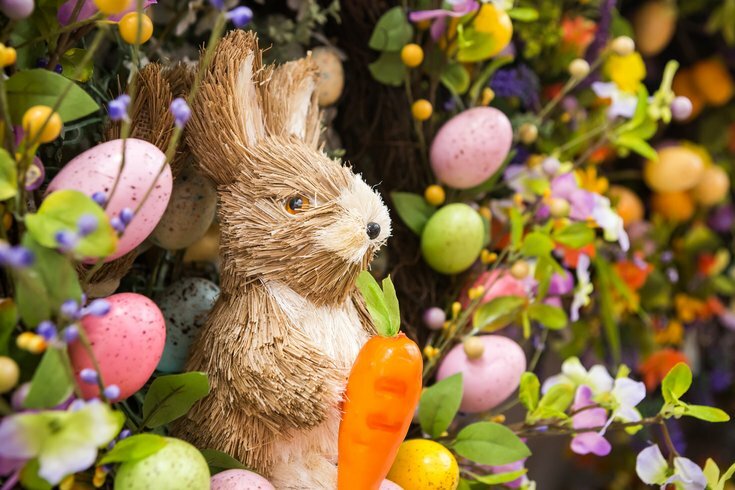 Head to Germantown for an egg hunt at the beautiful Awbury Arboretum. No registration is necessary. Just arrive by 10 a.m. with a basket. Families are invited to pack a picnic to enjoy on the grounds after the hunt. There will be a massive egg hunt on the beach for children up to age 7. Kids can search for 100,000 eggs scattered in the sand. The eggs will be filled with candy or items from local merchants. It will take place from the 11th Street beach to the 14th Street beach.